When most people think of the beach, they think of summer. We can’t blame you… there’s nothing like spending hot summer days laying on the sand soaking up the sun. But here in the Outer Banks, we are fortunate to have awesome beach weather for several months of the year – long before summer starts and long after it ends. 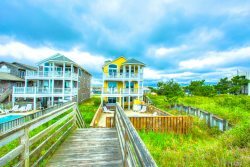 One of our favorite times for an OBX Vacation? Spring! Springtime in the Outer Banks is beautiful. The weather is warmer, the sun shines longer, and the roads are still a little less crowded. You deserve a vacation and Spring is the perfect time for a romantic getaway, guys trip, or even a mini-escape for you and your friends! Before you dismiss the idea of coming to the beach anytime but during the summer months, read our list of reasons you’ll love Spring in the Outer Banks. A lot of our visitors come down to North Carolina from Northern states like Maryland, Ohio, Pennsylvania, New Jersey, etc. We know it’s cold up there, especially during the early Spring months. Luckily for beach lovers, it starts warming up here around March and once it warms up, the weather generally stays pretty moderate. Not only is this perfect vacation weather but it’s a nice reprieve for anyone wanting to escape a late winter blizzard! The average temperature in Nags Head is usually several degrees warmer than in most major cities to our North during March, April and May. In case you were curious, the following chart highlights some of the temperature differences during Spring months in comparison to the temperatures in the OBX. Most people are pretty much over the winter weather by March so 50 degrees Fahrenheit sounds like a pretty godo deal. And the average Spring temps overall are perfect for exploring new sites, doing some local shopping, or even lounging out on your deck with a good book. It’s that sweet spot of not too hot but not too cold. The bottom line is that vacation rentals are more affordable during the Spring. In fact, they are a fraction of the cost of peak summer rentals and at those prices, you should definitely take advantage! We offer dozens of affordable condos, townhomes, and bungalows that are perfect for a smaller party (ranging from 1 to 4 bedrooms) meaning you can still stay in an awesome vacation rental no matter the size of your party. To make it even easier for you to visit, many of our homes offer partial stays* during spring and we even have several homes that offer Any Day Stays**! A lot of people associate vacation rentals with week-long summer vacations but there's no need to spend your Spring trip in a small hotel room when you could have access to a full kitchen and living area! Plus you save money just by being able to cook in your own kitchen! We'd mention the incredible views... but they speak for themselves. *Partial stays require a minimum reservation of 3 nights, with check-ins on Friday, Saturday or Sunday. **Any Day Stays properties require a minimum reservation of 3 nights with the option of checking in any day of the week. Many local shops and restaurants close down during the off-season. Luckily, March is when most of those businesses re-open for the year. In other words, vacationing in the OBX during Spring literally means you get access to the same awesome places you do during the summer months but with less traffic, shorter wait times, and discounted prices. As an added bonus, the Sping season is great for Yellowfin Tuna, Mahi-Mahi and Clams so you are sure to get some of the freshest seafood when you order a meal in one of our local OBX restaurants. Check out what other seafood is in-season during Spring!